Day 14. Dalmally to Dunoon. 53 miles. Often our last day of a trip is a bit of a trial of ‘getting there’ but today was a pleasant day cycling – no major wind, no big hills, lovely scenery and cruising to 50 miles by 2.30 (although that shows how much fitter we have got over the last 2 weeks). After a rather mediocre meal at the local hotel last night and rather mediocre breakfast we set off with, at least, our stomachs full. Our B&B was pleasant – new owners had taken over 6 weeks ago and were ‘de-chintzing’ the place but there was still quite a lot of pink about! Have decided airbnb is much more our thing – and talking to Charlotte (Loch Tay) it has been a boon for many rural areas in Scotland. For example the Highland 500 – a 500 mile circle round the northern highlands (car or cycle) has been heavily promoted and has been highly successful – but there was a real shortage of accommodation along to route, encouraging lots of people to use their spare rooms for airbnb and generating much needed cash for many families. We have found it much more relaxed than formal B&Bs. In fact where we are tonight our host is not even here (‘sorry I won’t be there, key is under the frog, make yourselves at home and use the whole house’) – it is reassuring that it still works successfully on a lot on trust. 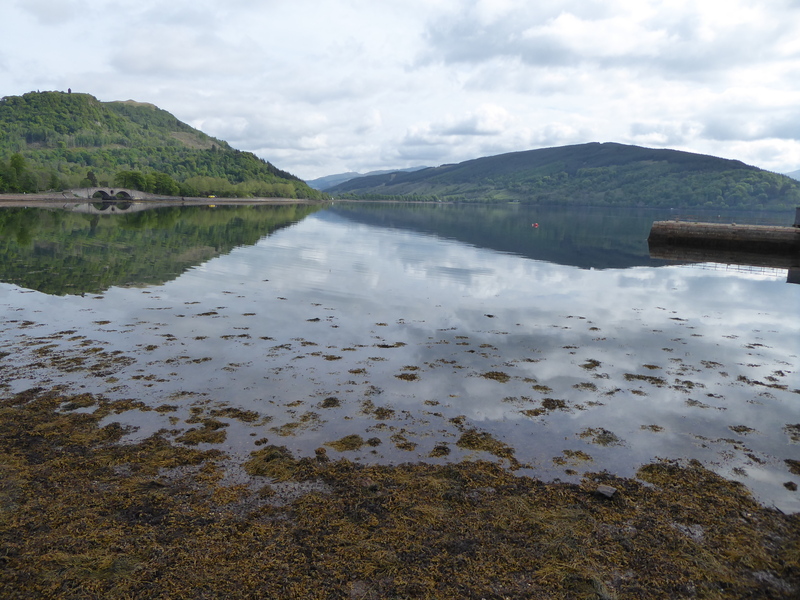 Back to today though – a day of Lochs. 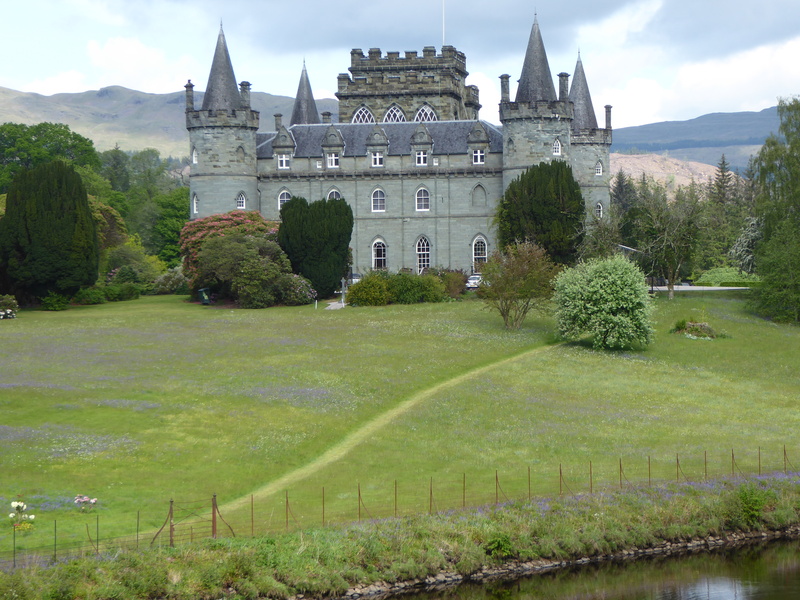 We started off with a few miles along Loch Awe then cut across to Loch Fyne (the only significant hill of the day) which we joined at Inverary – a pretty black and white village right on the shore with a turreted ‘castle’. We arrived in sunshine with beautiful reflections on the water again. We had to do a big loop round the top end of the Loch – about 16 miles to take us back to a point opposite Inverary. This was a more main road with quite a lot of traffic but it was flat and the road surface was good and we scooted along at a pace. Having just turned the top of the lake there was a ‘bang’ and David’s back tyre was flat – the only puncture so far. There was a handy layby to repair it and we were soon on our way – just another half mile to a good coffee stop at the ‘oldest Inn in Argyll’. Then a kick in the legs – just after coffe (and before we got warmed up) a 12% hill to climb out of nowhere. 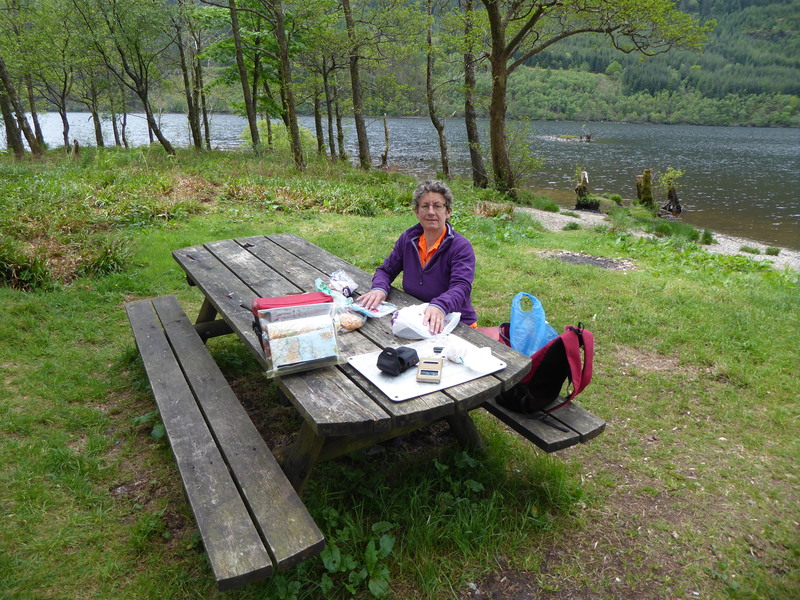 We made it up and then ambled along at a good pace along the shore before cutting over to Loch Eck, where we found a lovely picnic place with views up and down the Loch. 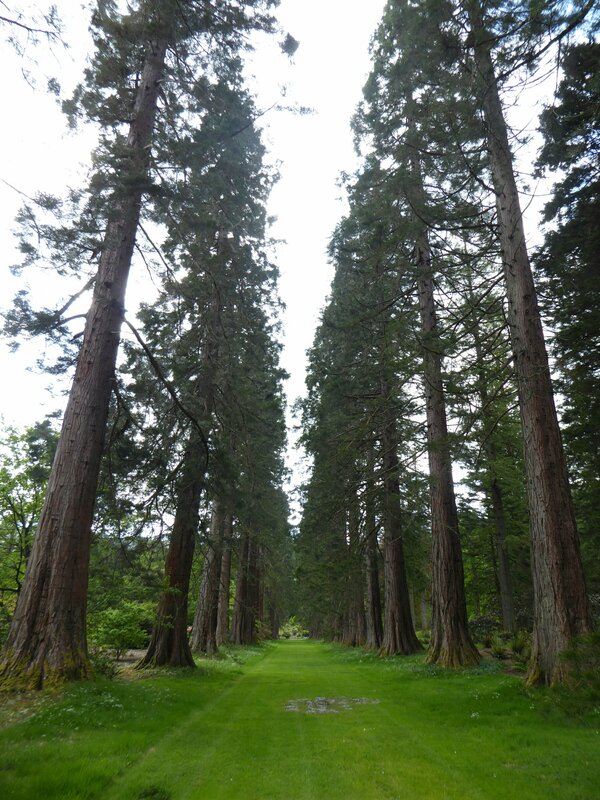 Just a few more miles and we reached Benmore Botanic Gardens just as the sun came out again and our main destination of the day. The gardens were beautiful in a fantastic setting. 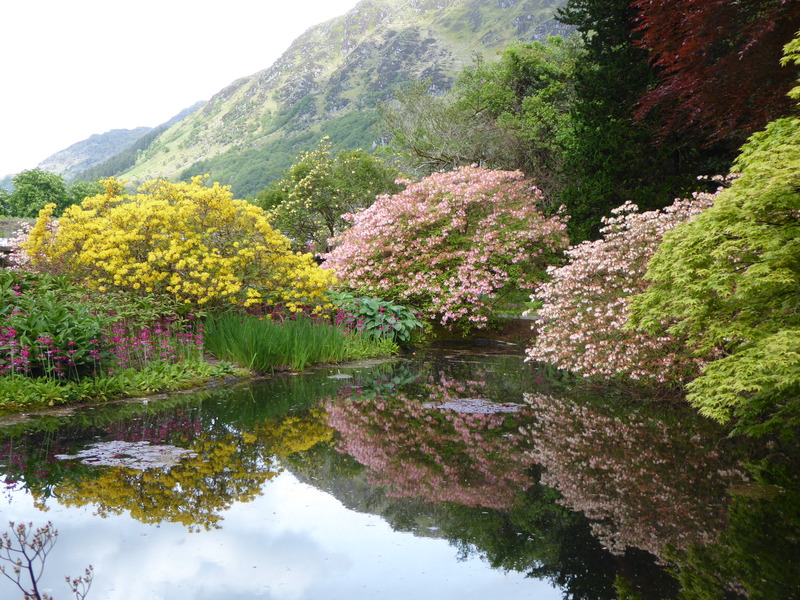 They have 300 species of rhododendron and azaleas – many of which were in bloom. The more formal gardens at the bottom change into more of an arboretum as it climbs up the hillside with many and varied exotic trees and a great viewpoint at the top. 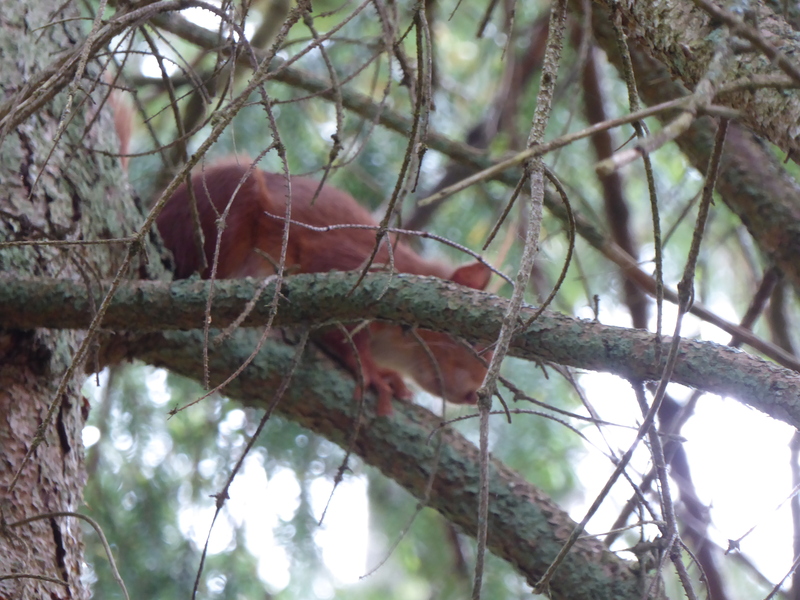 We saw a red squirrel and David even managed to get a photo. Then we climbed to the top and watched a big white bird of prey (?possibly an osprey) circling up in the thermals in the valley. This is when the binoculars really come into their own and justify lugging them around Scotland. 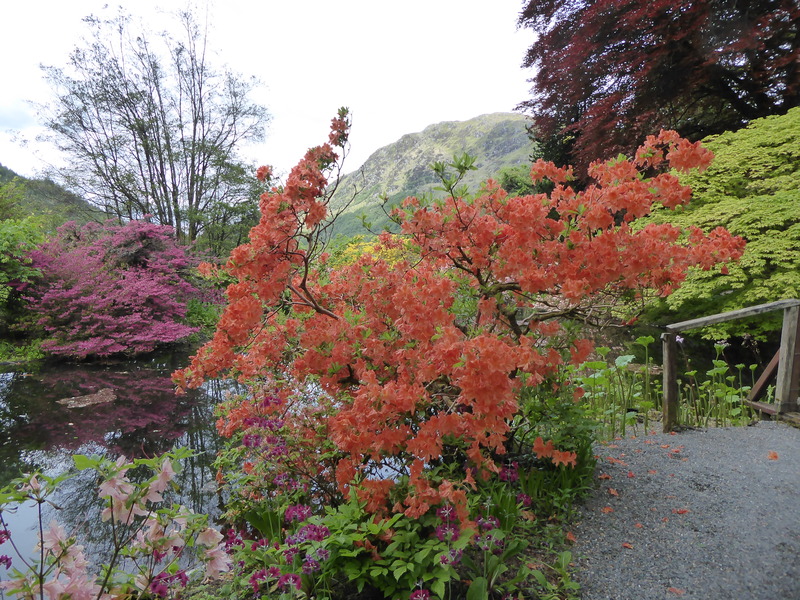 The garden was badly affected by a hurricane in 1988 which resulted in 500 substantial trees in the garden blowing down and a countless number of smaller ones. In many ways a tragedy but they have used the opportunity of the now clearer slopes to plant rare species for conservation. For example there was a whole ‘Chilean’ area with many species of endangered monkey puzzle trees planted – small now but will look amazing in 20 years time. 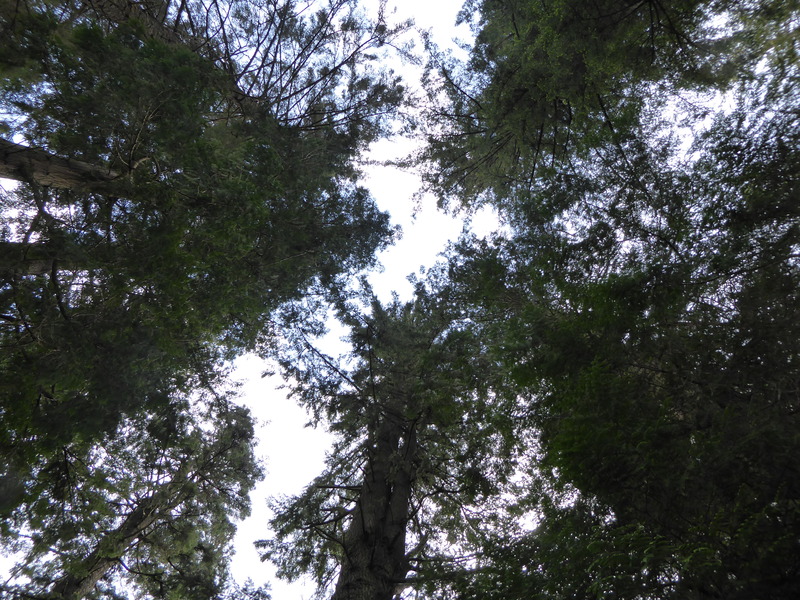 There was another area of Bhutanese plants. There was also an amazing Victorian fernery that had recently been renovated – a combination of stone building and greenhouse full of exotic ferns. 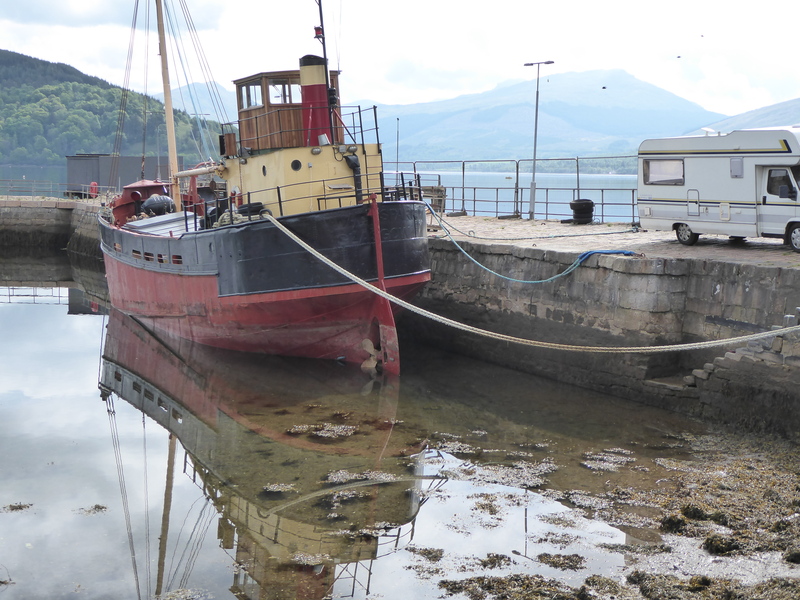 A very enjoyable visit then just a few miles to our airbnb house for the night just outside Dunoon and hot water (once the boiler man had finished complaining about how long it was since the /boiler was last serviced) . A great day. So glad your injuries did not impede you and well done for completing the journey. Thank you for sharing with us the beauty and the challenges. It’s whetted my appetite for returning there and re-exploring!